You are here: Home / South America / Brazil / Belem & The Amazon: My Home In Brazil. The Portuguese landed in Belem at the mouth of the Amazon River yet still 120km from the Atlantic Ocean in 1616. Interestingly enough the voyage from Lisbon to Belem, due to prevailing winds and strong currents, took longer than the trip from Belem to Salvador. 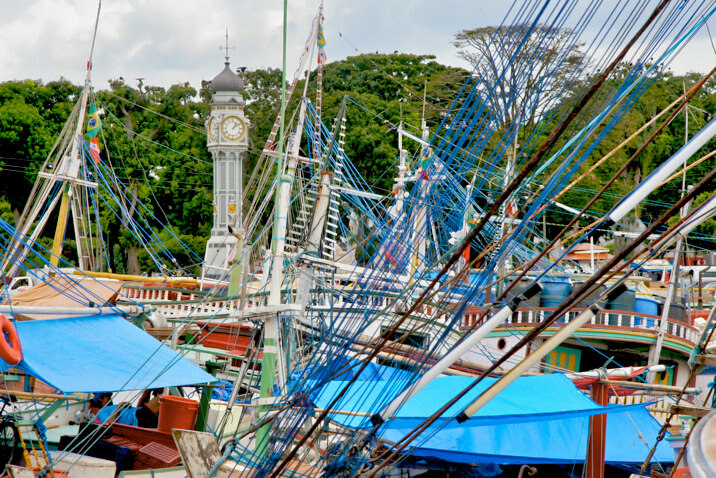 Today, with nearly 1.5 million people Belem is the economic center of the Amazon region and the capital of the Brazilian state of Pará. Money poured into Belem due to massive rubber business just before the turn of the century. Evidence of Belem’s rich past and history is evident along the waterfront and the various parks and plaza throughout the city. Rubber has since given way to timber, soy, fish and shrimp as most of the 800,000 tons of cargo that pass through Belem annually. Relishing in its historic past the riverside market Ver-o-Peso, is a kaleidascope of color, activity, hussle, bustle and vibrancy. Named by the Portuguese where merchants ver o peso (check the weight) of the product in order to impose taxes. 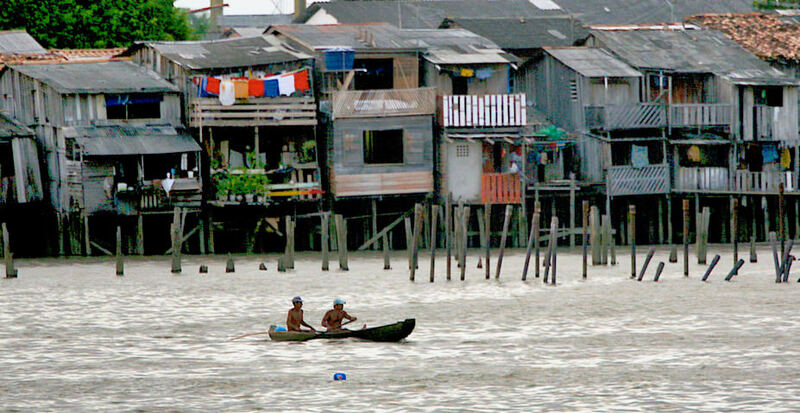 The fisherman’s port in Belem on the Amazon River. West along the Amazon the river culture abounds. 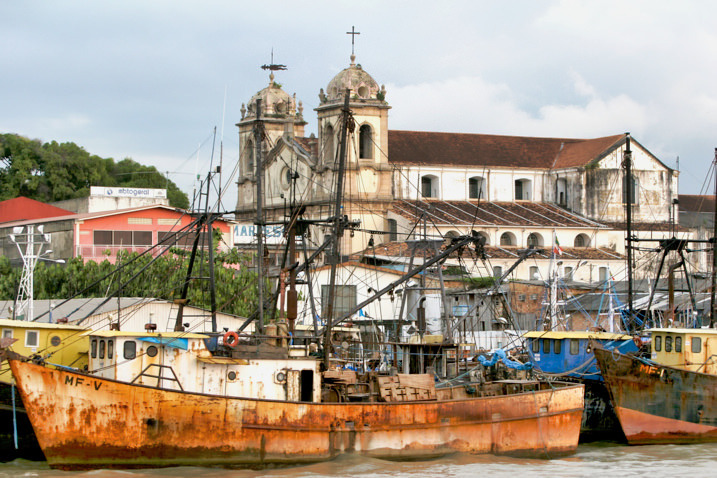 Hundreds of years old, the Ver O Peso market is the staple of the local economy in Belem. 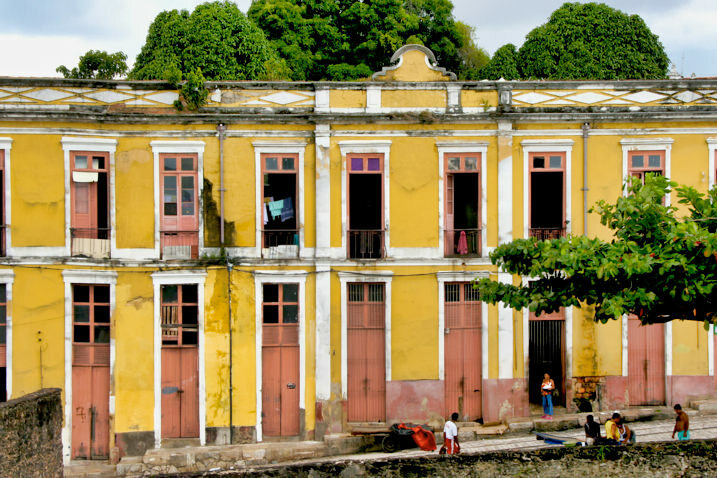 Colorful Brazil is evident on every corner, street and the clothing of the locals. The Amazon river, as it approaches the Atlantic Ocean, splinters and divides into hundreds of channels and branches. There are islands, bays and tributaries all around Belem. And thanks to my host Alex and his friends André, Marden and Manoel I enjoyed the city as a local for more than a week while I organized the shipping of my motorcycle from Belem to Buenos Aires in order to escape the prying eyes and hands of the Brazillian Federal Police as my temporary import permit was due to expire within a week of my arrival in this wonderful city. Alex a thirty-something motorcyclist and evangelist of the Brazil Riders hospitality group who have welcomed me throughout Brazil, lives just outside the city center near the Parque Zoobotánico where I was able to stay while taking in the city and wading through the beuarocratic tape necesary to “export” my motorcycle to Argentina. Alex and his spanking new Yamaha XTZ 250 fuel-injected super motard version of the enduro bike that I only saw in Brazil. With two cellphones perennially glued to his ears, Alex peers through his wire-framed glasses and offers a huge grin when spontaneity grabs him and he whisks away to our next adventure. His English is about as good as my Portuguese which made communication fun and challenging at times. 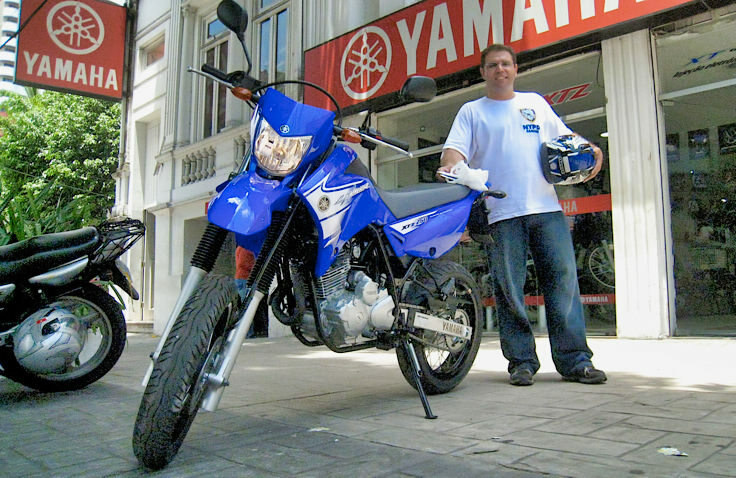 During my time in Belem, Alex took possession of a new Yamaha 250cc motorcycle. Sadly I don’t think we’ll ever see this fuel-injected enduro motorcycle marketed in the United States any time in the near future. I was offered the opportunity to ride this and another 125cc bike while biding time during my more than week-long stay in Belem. Alex and his family operate a motorcycle parts & accessories and repair facility which sits in front of and under their home near the city center. Each morning Alex and I rode to the “loja” (store in Portuguese) where he or his father would serve me coffee and breakfast. 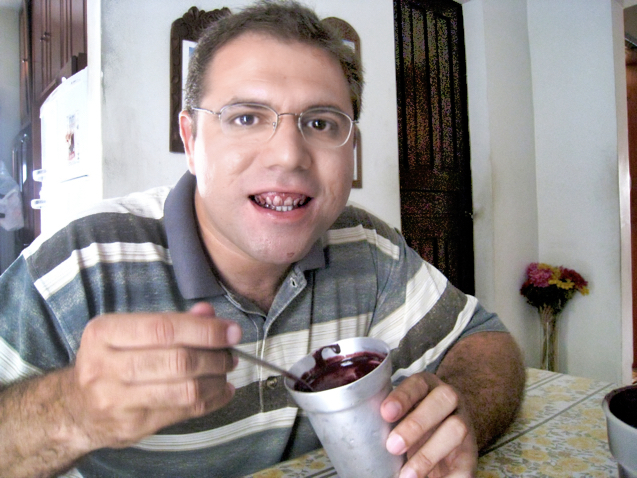 One morning we stopped by a small shopkeeper who was blending fresh Acaí, a fruit only grown in the Amazon and infamous for its medicinal and health properties. The juice made from this fruit is thick and syrupy and leaves purple teeth and tongues perhaps better than a night of drinking red wine. 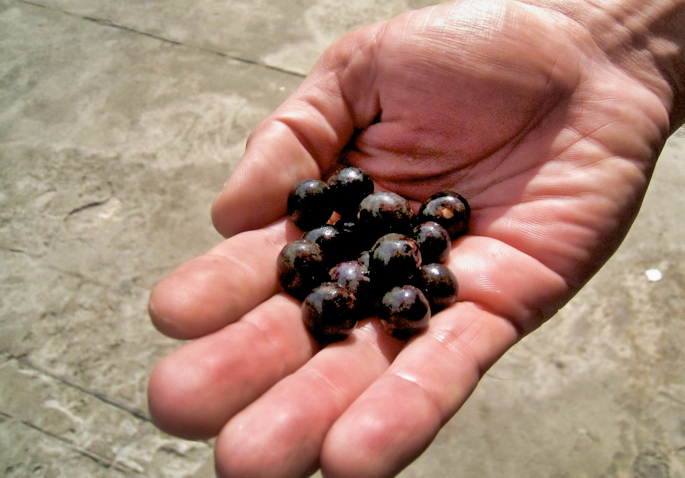 The dark purple acaí fruit is a staple in the Amazona diet. As a beverage it the fruit is extracted to a syrupy highly viscous juice that is rich and concentrated. It is also used as a condiment and ingredient in many Amazona dishes. I enjoyed it – in small doses. Here Alex shows off the effect it has on your tongue and teeth. Another version of the classic Brazilian moqueca. 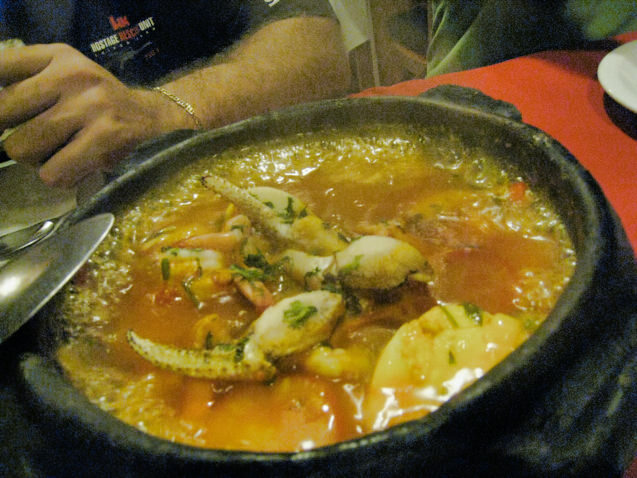 Served steaming and bubbling, this one included exotic fish and crabs found only in the Amazon. Alex’s “Pi” (dad) and I hung out during breakfast and lunch. The fresh fruit juices he made from exotic fruits I’d never seen nor tasted were fantastic. Lunch was also a ritual with Alex and his family, afterwords which the shop would remain closed for a couple hours while Alex, his father and others napped. A couple afternoons I spent with one of Alex’s closest friends, Andre, who would cart me around to the airport, phone center and other places while I ticked off my checklist in order to prep my journey back to Argentina. One afternoon we took a ride to the tiny island of Mosqueiro which sits at the confluence of the Amazon where there is a bay (Baia de Guajara) and the river throws up these powerful ocean-like waves. So Andre & I jumped in and body-surfed the only fresh-water waves (surf-able) in the world. During my time in Belem with Alex, his family and friends it soon became clear to me that Belem was like my home in Brazil. I was having my meals with the family, staying in a nice condominium and hanging and visiting with locals. https://i1.wp.com/www.worldrider.com/wp-content/uploads/2014/08/Belem_colonial_rustyboat-tm1.jpg?fit=600%2C400 400 600 allan https://www.worldrider.com/wp-content/uploads/2014/08/worldrider_logo_white_border-trans1.png allan2007-10-18 06:54:422007-10-18 06:54:42Belem & The Amazon: My Home In Brazil. Surfing on a river? Amazing. As is the incredible warmth and generosity of Alex and his family. Great stuff.